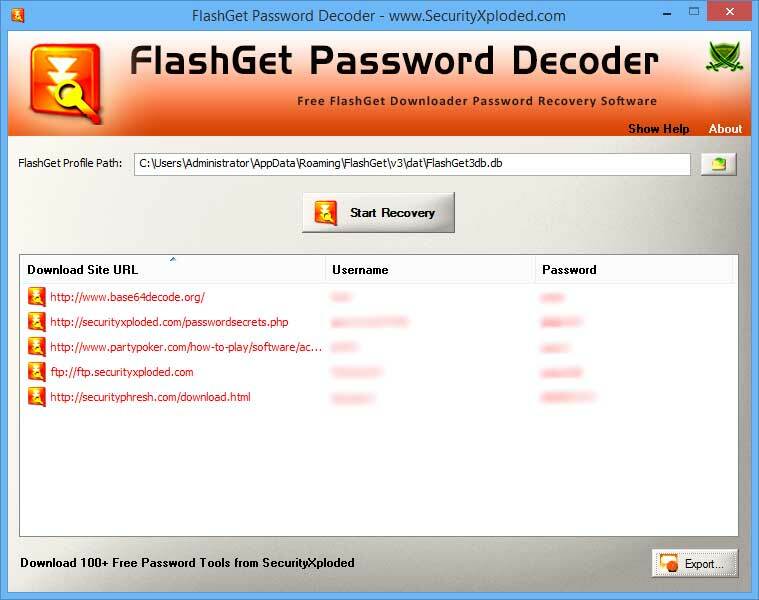 FlashGet Password Decoder is the FREE tool to instantly recover all your lost or forgotten website passwords from FlashGet software. FlashGet is popular download manager software supporting HTTP, FTP, BitTorrent & other protocols. Like most of the softwares, it also saves the passwords for downloaded websites or torrent sites. FlashGet Password Decoder helps you to automatically find and recover all these stored passwords from FlashGet password file. 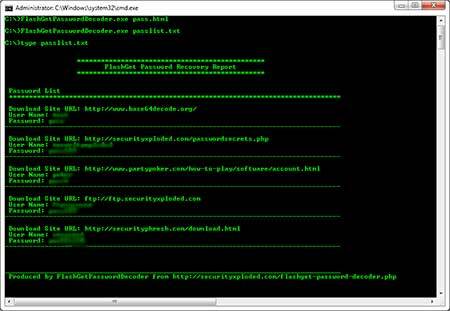 Once recovered, you can also backup the password list to HTML/XML/TEXT/CSV file. FlashGet Password Decoder is fully portable and works on both 32-bit & 64-bit platforms starting from Windows XP to Windows 8. 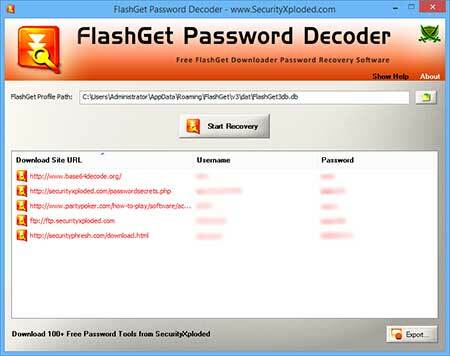 FlashGet Password Decoder comes with Installer so that you can install it locally on your system for regular usage. It has intuitive setup wizard which guides you through series of steps in completion of installation. FlashGet Password Decoder is easy to use with its simple GUI interface. 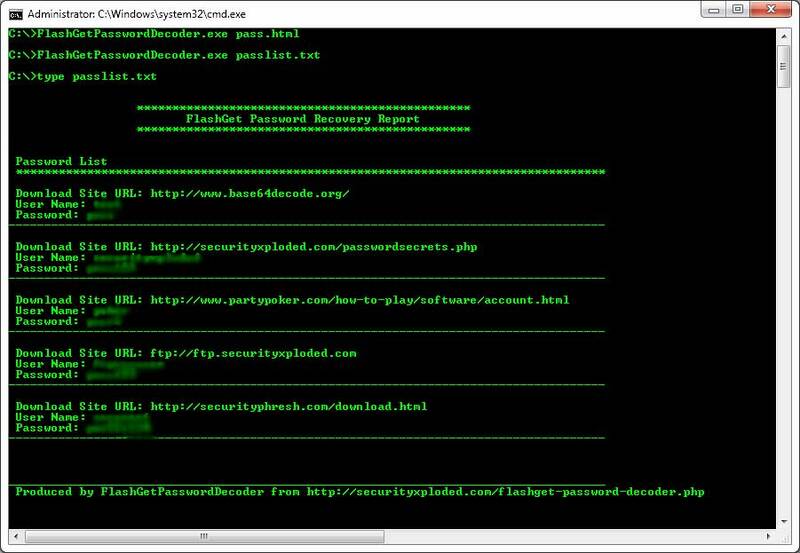 Launch FlashGet Password Decoder after completion of installation. Next click on 'Start Recovery' button and all login passwords stored by FlashGet will be recovered & displayed as shown in screenshot 1 below. 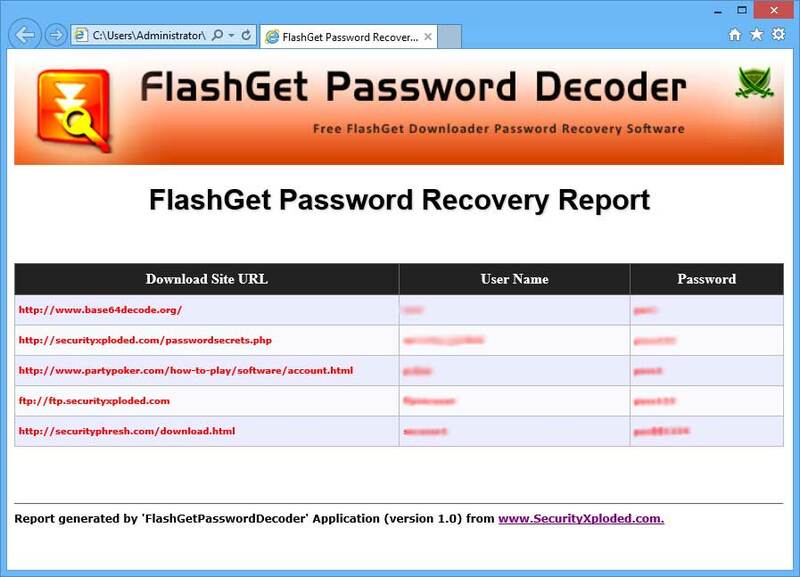 Screenshot 1:FlashGet Password Decoder is showing the recovered login passwords from FlashGet. Screenshot 2: Command line usage showing various examples. 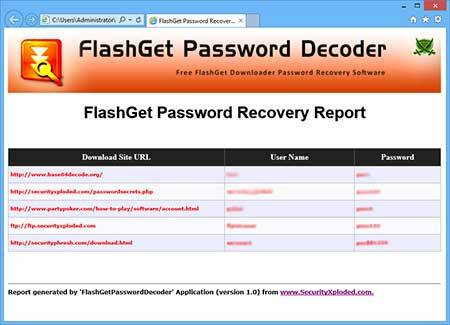 FlashGet Password Decoder is not a hacking tool as it can recover only your stored passwords. It cannot recover the passwords for other users unless you have right credentials.